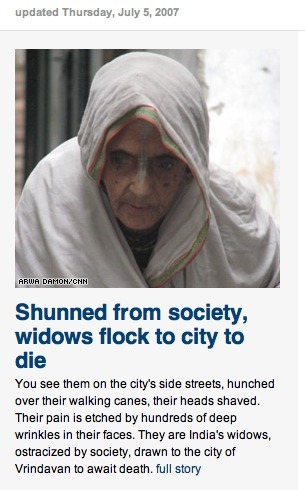 Ostracized by society, thousands of India’s widows flock to the holy city of Vrindavan waiting to die. They are found on side streets, hunched over with walking canes, their heads shaved and their pain etched by hundreds of deep wrinkles in their faces. I mentioned in May that Brazil had introduced compulsory licensing on a Merck AIDs drug Efavirenz, and heartily recommended that Brazil and other third world countries continue to play hardball with big pharma whenever they could. It looks like Merck decided to not bargain, but Abbott did on Kaletra. Note that Abbott got into a similar controversy with Thailand, and agreed to drop the price when Thailand rejected the Kaletra patent. Keep it coming, third world countries. Bargaining is perfectly acceptable in the marketplace! razil’s health ministry said Wednesday that Abbott Laboratories Inc. agreed to cut the price of its Kaletra AIDS drug by 29.5 percent. The lower price for the drug, also known as lopinavir and ritonavir, will help Brazil supply free drugs for its AIDS treatment program. In May, President Luiz Inacio Lula da Silva authorized Brazil for the first time to break the patent on an AIDS drug, one made by Merck & Co.. It then started importing a generic version of the drug Efavirenz from India. Under WTO rules, countries can issue a “compulsory license” to manufacture or buy generic versions of patented drugs deemed critical to public health. Drug makers often reduce prices to keep countries as clients and avoid compulsory licenses. Good, I guess. The Europeans demand a lot of testing on their food, and if they can share information with the FDA on general trends, and even specific batches of food ingredients, the FDa gets a lot of information without having to setup any kind of infrastructure, or have manufacturers scream at them for insisting they perform tests they’re already performing for the European market! In regulation, the strictest one eventually wins as long as it has enough of a market that it cannot be boycotted/ignored. The U.S. Food and Drug Administration said on Monday it signed a pact with European regulators to share more information about the safety of the food supply. The FDA said the agreement with the European Food Safety Authority would pave the way for formally sharing confidential scientific information and that it would help protect confidential information under both regions’ laws.